The savory flavor of Larry’s Mole Sauce and slow-cooked pulled pork is one of the best flavor combinations ever. Pulled pork without bbq sauce is getting easier to find in grocery stores and Hispanic markets. Napa cabbage has the perfect balance of crunchiness and tenderness that makes it a better choice for tacos than green cabbage or lettuce. Pour Larry's Mole Sauce into a medium-sized saucepan. Add the pulled pork, cover and simmer over medium low heat for 10 to 15 minutes. Warm the corn tortillas in a microwave until they are pliable. Cover and keep warm. Place the shredded cabbage in a bowl, pour the lime juice over and stir. 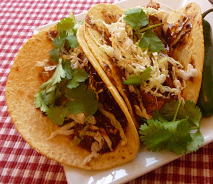 Place equal amounts of the mole pulled pork mixture on the warm tortillas, sprinkle with equal portions of Napa cabbage slaw and garnish with the minced cilantro.